The fire occurred last weekend in an inner courtyard of the medical center, although it was suffocated really fast. 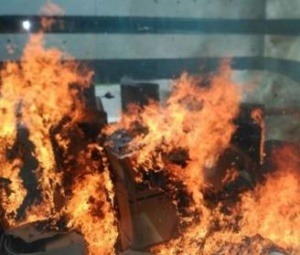 The Hospital la Fe in Valencia lived a little scare day when, due to still unknown reasons, a small fire broke out in an inner courtyard where there were cartons and some accumulated work material. Luckily the fire was extinguished in less than half an hour. All the firefighters available in the South Park of Valencia went to the place, including a pump of water and an ambulance, although it did not have to act because there were no people affected by the fire nor by the smoke. In fact, as confirmed by firefighters and the hospital itself, the smoke did not enter the facilities of the health center, so, despite the spectacular smoke, the incident occurred without major consequences for people and furniture. Fortunately, neither the patients nor the hospital activity were affected by the incident. Although the fire was not very virulent, the smoke could have entered the center and caused damage to patients and workers. As we have mentioned before, the smoke inhalation is the leading cause of death during fires. That is why we recommend that you take the necessary precautions by installing suitable fire protection systems.